After yet another mind-blowing twist, the Titans' assault on the city Trost continues. Episode 9 opens with the audience's first real introduction to Levi, the most bad*ss Titan slaying machine in the Survey Corps. The first 8 minutes of the episode essentially introduces The Scout Regiment to the audience and showing why they were not inside the inner wall when the Titans attacked Trost. Other than Levi's brief moment of awesomeness, another notable character, Zoë Hange, is introduced. While I do not know much about the character other than the gender of the character is ambiguous in the manga, whereas Zoë is definitely a woman in the anime series, her brief scenes were interesting, but not much about the character is revealed. After those 8 minutes, the episode flashes back to what happened to Eren after being eaten by the bearded "Santa Claus" Titan. With Eren in the stomach of a Titan, we see how he escaped by turning into a Titan. Following the flashback, Commander Kitz Woermann must decide whether or not Eren is a threat. Seeing Mikasa stand up for Eren to protect him was not surprising considering the previous episodes and her protectiveness of him. The episode concludes with Woermann ordering the wall cannons to fire, which caused Eren to have a quick flashback with his father telling him something important about his mysterious power. Eren uses his Titan powers to transform partially into a Titan to save his friends. 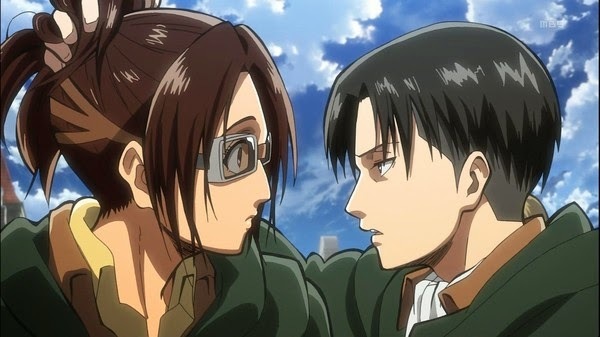 While there is normally quite a bit to discuss with AoT episodes, there was not much to episode eight of Attack on Titan. Even though it was certainly a cool episode with the usually amazing animation, it was more of a setup for what is to come, which is not necessarily bad, but it is certainly not on the same level of the previous few episodes. Overall: 7.8/10- While still undeniably entertaining and epic, episode eight of Attack on Titan felt more like a bridge to the next episode than providing anything substantial.